When you create a chart in Excel, you may find that you need to change the order of the way the data series is displayed in your chart. For examaple you may have a Minim, Maximum and Average Sales price in your chart data which you want to display in the order Average, Maximum then minimum. You could change the order of the data in your data source in your work sheet range which would automatically change the order of the chart data display. If you do not want to amend your source data, you can manually change the series order by customising the Excel chart. I have already calculated my Minimum, Maximum and Average value sales for my products, which I now just need to create a chart with. We want to change the data series sequence so the Average sales data in in the middle of our data seried, with Minimum on the left and Maximum on the right. In the list of data series at the left of the dialog box, click once on the one you want to move. 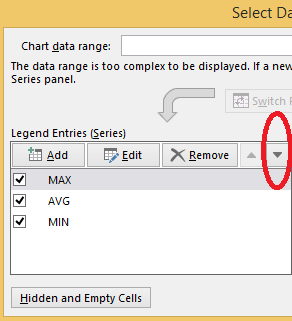 Use the Up Arrow and Down Arrow buttons to reposition the selected data series. 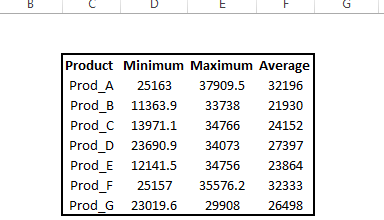 In this example I have moved the Average Data Series to the middle of the selection. A structured and comprehensive online training program for learning Microsoft Excel. It is full of real world examples to work through.